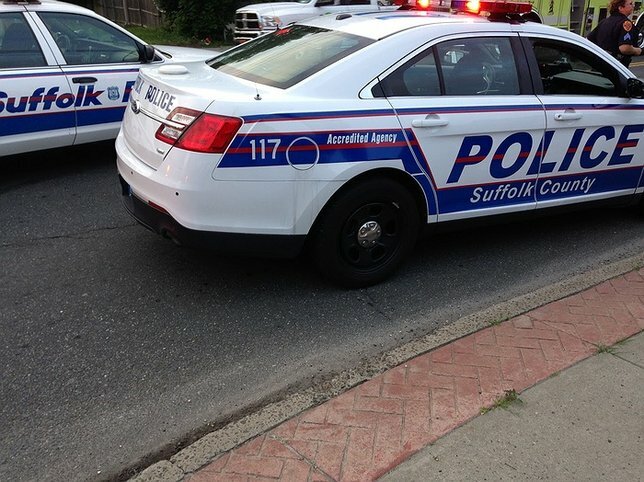 Suffolk County Police Fourth Squad detectives are investigating a multi-vehicle crash that seriously injured a man in Islandia yesterday. Douglas Rodger, 55, of Long Beach suffered partial paralysis from the chain reaction crash. Islandia, NY - February 22, 2017 - Suffolk County Police Fourth Squad detectives are investigating a multi-vehicle crash that seriously injured a man in Islandia yesterday. Douglas Rodger was driving a 2013 Hyundai approximately 1000 feet west of Exit 57 on the Long Island Expressway westbound, when his vehicle struck a 1998 Plymouth that was stopped in traffic in the left lane at approximately 5:40 p.m. The crash set off a chain reaction with the Plymouth striking a 2000 Toyota, which struck a 2016 Mitsubishi, which struck a 2014 Chevy. Rodger, 55, of Long Beach was transported via Suffolk County Police helicopter to Stony Brook University Hospital in serious condition. He suffered partial paralysis. The driver of the Plymouth, Christian Dominguez, 35, of Brentwood, and Darlene Rosales, 16, of Bay Shore, a passenger in the Mitsubishi, were transported to Southside Hospital in Bay Shore with non-life-threatening injuries. The vehicles with the injured victims were impounded for safety checks. Westbound traffic was closed until 10:15 p.m.
Subject: LongIsland.com - Your Name sent you Article details of "Man Seriously Injured During Multi-Vehicle Crash in Islandia"